This week, North Carolina Governor Roy Cooper was selected as a climate leader to testify on Capitol Hill before the House Committee on Natural Resources. Governor Cooper called for bold climate action, including increased protections for our forests. But his actions in North Carolina tell a different a story. 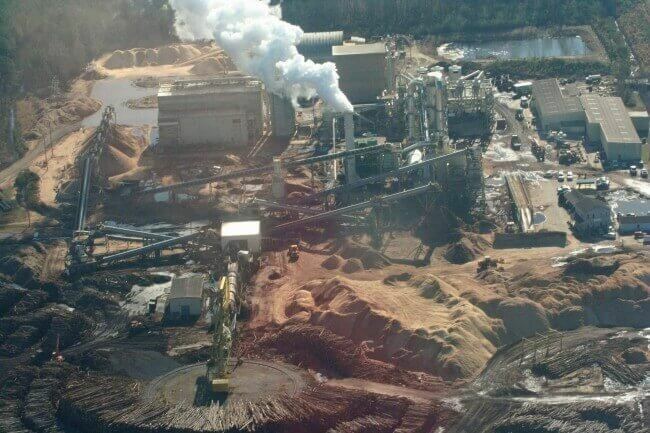 Every year, tens of thousands of acres of North Carolina’s precious forests are cut down, turned into wood pellets at one of Enviva’s mills, and shipped overseas to be burned for electricity. At every step of the process, the wood pellet industry hurts our communities, destroys our forests, and imperils our chance to avoid a climate disaster. North Carolina would become the country’s largest pellet exporter, sending 2.5 millions tons per year of wood pellets overseas. That’s 60,000 acres of North Carolina’s forests each year. These forests draw carbon out of the atmosphere and store it in trees and soils, protect us from flooding and storms, and provide us with clean air and water. Despite their lip service on climate action, Governor Cooper and the NC Department of Environmental Quality (DEQ) continue to stand behind industries that take us backwards on climate change. After years of missteps surrounding Enviva’s Richmond County facility, DEQ and Governor Cooper’s administration had the opportunity to do the right thing: deny the expansion and require Enviva to install the air quality controls that they should have had since Day One. But again, DEQ let the community, our forests, and the climate down. Governor Cooper even recognized during his testimony on Wednesday that there’s a growing concern about the wood pellet industry in North Carolina. Despite this noted widespread public opposition, NC DEQ recently granted Enviva’s Richmond County facility the permit they need to expand production. 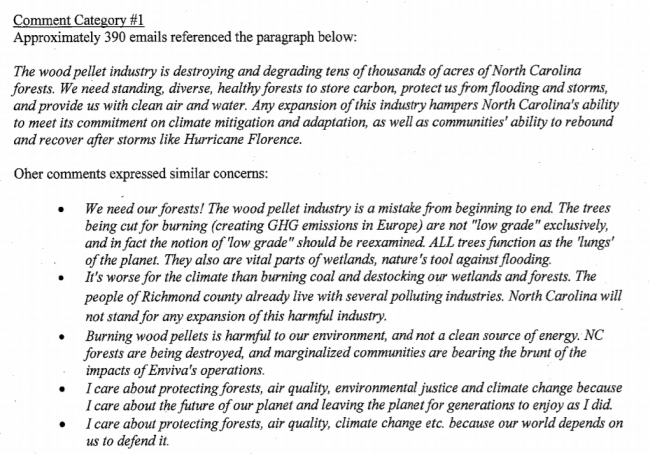 Let us be clear: Any expansion of the wood pellet industry stands in direct contradiction with North Carolina’s commitment and responsibility to act on climate change. Our elected officials work for the people of North Carolina, not for big industry. And the people of North Carolina have been loud and clear about their opposition to the wood pellet industry. In November 2018, NC DEQ held a public hearing on Enviva’s proposed expansion in Hamlet. 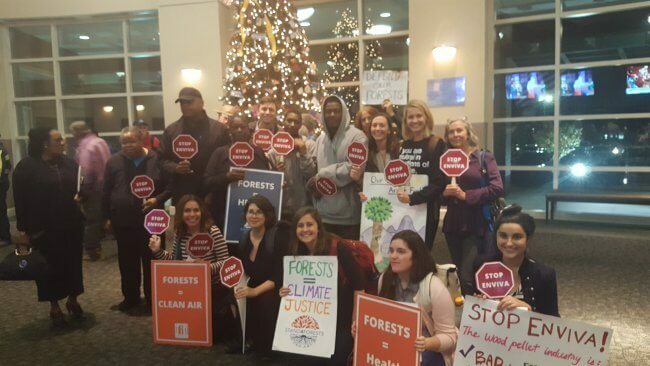 The Dogwood Alliance community joined local concerned residents and environmental justice advocates in a united call for clean air and increased forest protections. Local concerned residents and environmental justice advocates from across the state joined in Hamlet to speak out at the November public hearing. Dozens of people spoke at the hearing opposing the draft permit, which would grant Enviva’s expansion, and hundreds more submitted comments online. 40 environmental and social justice organizations signed a letter urging DEQ to modify the permit to enforce reductions in production and emissions. Yet NC DEQ failed to respond to the central argument of our comments – that Enviva is a major source facility, not a minor source. While the final permit does increase emissions testing requirements, it also allows Enviva to expand to over 600,000 tons of wood pellets per year — without addressing calculations that Enviva will certainly be in violation of federal air quality standards at this level. In DEQ’s report, they noted that there were over 400 comments from people who expressed concerns about increased logging. DEQ’s response? They cited Enviva’s own Track and Trace data, which we continue to point out is merely destruction in disguise. Hundreds of people wrote to DEQ to oppose Enviva’s expansion and support clean air in Richmond County. Read the full Hearing Officer’s Report and Recommendations here. Perhaps most problematic, NC DEQ responded to public concerns about Enviva’s climate impacts by claiming that biomass is carbon neutral. This flies in the face of leading science around the carbon impact of the wood pellet industry. Meanwhile, North Carolina’s counterpart agencies in other states are taking action to address the threats that the wood pellet industry pose to communities. In Louisiana, for example, state regulators recently identified biomass giant Drax and its wood pellet facility in Bastrop, LA as a major source polluter and have placed the facility on a mandatory “compliance schedule” requiring Drax to correct its longstanding violation of the Clean Air Act. DEQ has failed North Carolina by not taking similar steps. NC DEQ’s response leaves us wondering: How can our state be a true leader on climate, when our leadership fails to face the truth on the biggest climate scams happening in our state? With one hand, Governor Cooper signs a sweeping climate executive order, setting ambitious goals and putting plans in motion to reduce greenhouse gas emissions and make North Carolina more resilient. With the other hand, the Cooper administration and DEQ continue to allow the destruction of our forests at the expense of communities and the climate. We cannot do both and meet our climate goals. 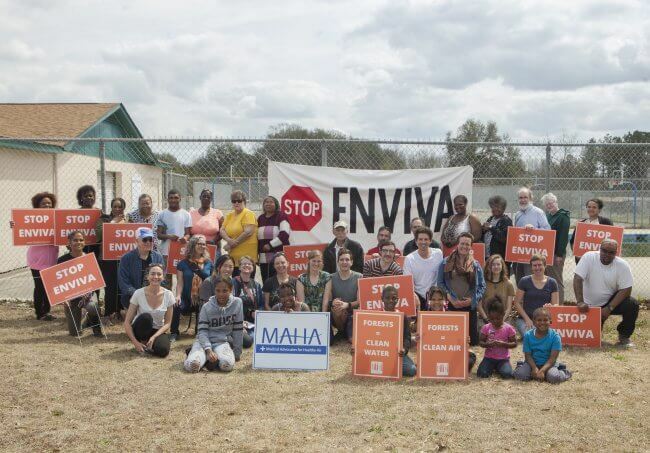 Residents of Dobbins Heights, NC join together to celebrate community and protest Enviva’s forest destruction in their backyard. On Wednesday, Governor Cooper urged the federal government to preserve forests, but the Cooper administration continues to green-light the destruction of forests in his own backyard. When Enviva expands, they drive more logging of important forests. They increase the burning of wood pellets, dumping more carbon into our atmosphere. And they release harmful air pollution, damaging the quality of life of surrounding communities like Dobbins Heights. That’s why we’re continuing to hold Governor Cooper and DEQ accountable to comprehensive, just climate action. In solidarity with our partners, we’re calling for increased forest protection, an end to false solutions like biomass and the wood pellet industry, no new fossil fuel infrastructure like the Atlantic Coast Pipeline, and a just transition to a 100% clean and renewable energy economy. We can’t achieve this vision without your support. Give $10 today to help us ramp up the pressure and achieve our vision for a clean and just energy future. Join us next week for a special Valentine’s Day action alert — and help us send the message that Governor Cooper needs to take real climate action, for the love of our planet. Share this blog to spread the word! Emily blends her love for the beautiful forests of the Southeastern U.S. with an enthusiasm for taking on the corporate interests that threaten our communities and our environment in the name of profit. She is a graduate of UNC Asheville, with BA degrees in Political Science and Sociology, and holds a Masters in International Studies and a Certificate in Nonprofit Management from NC State. Emily is an avid hiker and traveler and has explored trails in locations ranging from the Appalachians to the Himalayas to the Amazon.